If you’re looking for a ring that matches your dark and brooding style, your search can end here. The men’s black titanium spinner ring with a flat profile and glossy finish is unapologetically stylish in all the right ways. Titanium is quickly growing as a popular alternative to precious metals because it is budget-friendly without compromising the strength and sophistication you expect from a high-quality ring. 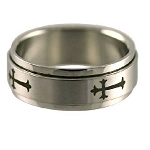 Spinner rings are taking the fashion world by storm, and JustMensRings.com has been paying attention. Each 8mm men’s black titanium spinner ring with a flat profile and glossy finish features a comfort-fit design that can accommodate large knuckles. Comfort-fit rings are easy to wear and easy to remove, so you can work or head to the gym with peace of mind. The men’s black titanium spinner ring with a flat profile and glossy finish will never corrode or tarnish over time, and titanium offers one of the highest strength-to-weight ratios of any transition metal. Whether worn as a wedding ring or an everyday fashion statement, the glorious gloss of black titanium will demand double takes everywhere you go. Our 8mm men’s black titanium spinner ring with a flat profile and glossy finish allows you to dress up or dress down with a built-in way to keep your mind and fingers busy. Comfort-fit rings tend to measure a half size smaller than traditional rings, so we recommend that you visit a local jeweler to have your finger sized for accuracy before ordering. If you have any questions, please don’t hesitate to contact us today for additional information or assistance. 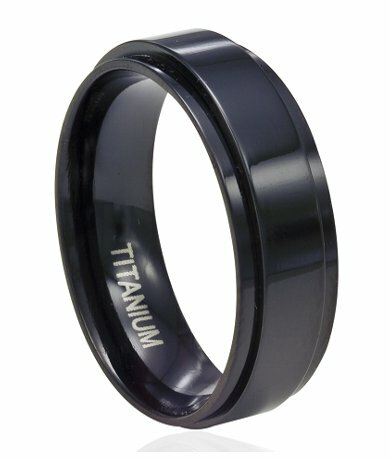 My husband has been wanting a black titanium wedding band. He picked this one out and he loves it. We were especially impressed with the customer service and fast shipping. We had to make an exchange for a smaller size and it wasn't a problem. I love to see my husband happy with his new ring. Thanks JMR! We love this ring! We originally ordered an 8 (his determined size) but it was about a 1/2 size too small so I would suggest going up a 1/2 size from what the jewelry store sizes him. The exchange process was super easy and we will shop here again! My partner absolutely loves this ring and says it is so comfy you don't know you are wearing it! Great light weight ring! I didn't realize it spins around until I received it. It also arrived in a speedy manner. This ring is beautiful in person! I bought this ring for my husband as a valentine's gift. It arrived quickly and it is a gorgeous ring. It fits him perfectly.